Samuel Alexander (Service No 1873) was born in Kangaroo Valley, N.S.W. Samuel married Eva Bellis on 1st March 1913. When Samual enlisted he was 27 years. He and his wife lived at Kiama where Samuel was working as a farmer. He had served 12 months with the Militia. Samuel embarked from Sydney on board HMAT A15 Port Sydney with 2nd Reinforcements, 34th Battalion on 4th September 1916. The troops arrived in England on 29th October 1916, and Samuel joined 34th Battalion in France on 18th January 1917. On 8th June 1917 Samuel was wounded, sustaining a gun shot wound to the thigh, and was evacuated to hospital for treatment. He rejoined his unit on the Western Front on 21st February 1918. On 2nd April 1918 he was wounded a second time, with gun shot wounds to his hands, and again evacuated to hospital in England for treatment. 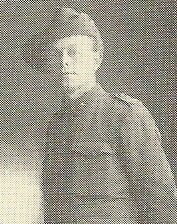 Samuel was returned to Australia in March 1919 and discharged on 11th October 1919. Samuel died in Dapto in 1959.